We are a leading Authorized Wholesale Dealer of steel wire rope fiber core and steel wire rope compacted from Hyderabad, India. We are a trusted name in the industry for wholesaling and trading Steel Wire Rope Fiber Core. The offered rope is made from high quality of stainless steel and has fiber as core. It is extensively used in construction industries. This rope is resistant to corrosion, acids, alkalis and is highly flexible. It is regarded by our clients for being durable and cost effective as well. 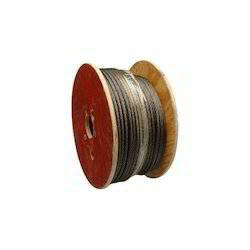 We are engaged in wholesaling and trading Steel Wire Rope Compacted. The product has earned us a huge clientele for being exceptional in quality. It has been sourced from an authentic vendor base for keeping in sync with the industrial standards. The offered rope is used in drilling line, work over line, swabbing line, sand line and pumping units. It offers a large surface area for the pulley and is safe to use. Looking for Steel Wire Rope ?